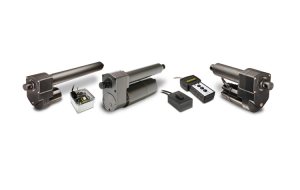 Warner’s range of electromechanical actuators are available to meet varying design demands, from light and general duty through to heavy duty applications. Warner linear actuators designed to be maintenance-free and have a long service life, keeping the total cost of ownership low by only sourcing quality components from ISO-accredited suppliers. Warner actuators feature solid spur gears, synthetic lubricant and high-performance motors to ensure that they are up to the task, whilst full gaskets, motor overload switches and corrosion protection as standard allow user peace of mind in all environments. All Torque keeps stock of the most popular units in the range, as well as overnight access to much of the full catalogue. Further information can be found at the Warner website. Remember that the site is American and to make allowances for dimensions, voltages etc.